Scroll down to see our selection of Bedpans and Fracture Bedpans for sale. Bedpans. 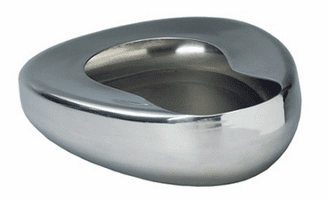 We carry several different style of bedpans in all the popular styles. We sell stainless steel bedpans for children as well as bedpans for adults, and the fracture bedpans especially designed for women. Our bedpans are reusable as well as autoclavable for sterile use. Bedpans are a fairly shallow vessel to be used by persons that are either immobile or confined to there bed to be used as a toilet or commode for urination or bowel movements while bedridden, bedpans may be reusable as well as autoclavable, which means the are able to be place in a sterilizing device for a clean safe alternative to a standard commode.